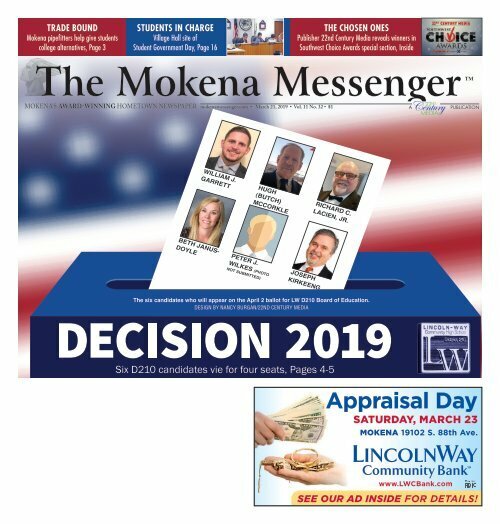 ® Trade bound Mokena pipefitters help give students college alternatives, Page 3 Students in charge Village Hall site of Student Government Day, Page 16 The chosen ones Publisher 22nd Century Media reveals winners in Southwest Choice Awards special section, Inside mokena’s Award-Winning Hometown Newspaper mokenamessenger.com • March 21, 2019 • Vol. 11 No. 32 • $1 A Publication ,LLC William J. Garrett Hugh (Butch) McCorkle Richard C. LaCien, Jr. Beth Janus- Doyle Peter J. Wilkes (PHOTO NOT SUBMITTED) Joseph Kirkeeng The six candidates who will appear on the April 2 ballot for LW D210 Board of Education. Design by Nancy Burgan/22nd Century Media Six D210 candidates vie for four seats, Pages 4-5 Appraisal Day SATURDAY,MARCH 23 MOKENA 19102 S.88th Ave. www.LWCBank.com SEE OUR AD INSIDE FOR DETAILS!